Some various tools I made for PC/Windows. Tiled is a very good Map Editor, unfortunately the file format output is an XML file, and it's not an easy format to read for example when using old console or computers, so I made this tool to convert the xml into a binary file easily readable. The package also contain a map split tool used to split a map of a fixed tile size to a lower tile size. For example if you want to convert a map made of 32x32 tiles to a map made of 8x8 tiles. This new version include options for little/big endian and word/byte output, as well as processing only one layer or a given number of layers, Minus one tile option, and remove file header option ! This tool Convert an 8bpp BMP to 4bpp, or a 4bpp BMP to 2bpp. 2bpp BMP are a Valid BMP format, BUT, most of the painting/viewer program won't read/write this format ! The only image viewer I know that can correctly read 2bpp BMP is XnView. 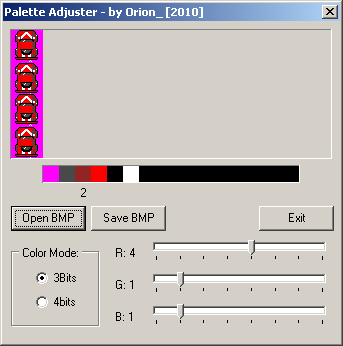 A little tool for adjusting colors when doing graphics for old computers or consoles. 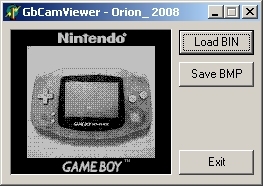 This little tool can load and display GameBoy Camera pictures from the captured GBPrinter communication raw dump, for example using ucon64. Complete description available in the readme of the zip file. This little tool allows you to capture Webcam pictures from the Internet using URLs. You can capture multiples pictures using a programmable timer and also directly capture these pictures into an 'avi' video file. ANSI Designed allows you to create ANSI pictures and export them in ANSI format. It was made with the project of running my own BBS server with nice pictures for example as a menu. 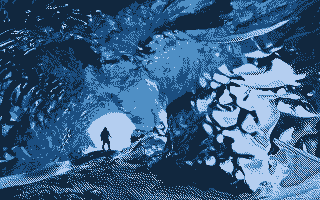 If you want to, feel free to send me pictures you have made with this tool (in .and format). I will gladly put them in a gallery if I ever run this BBS server one day. 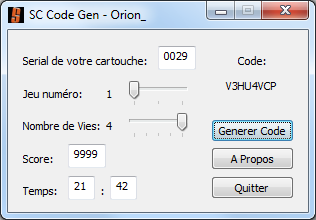 A little tool to generate passwords for the game "SuperConnard" by Furrtek on GameBoy.